Daily newspaper The Malay Mail will increase its print run from the current 35,000 to 1 million on a Monday in November 2012. “This is the first time any such campaign has been done and we want to prove to our clients and advertisers that this is a viable platform for them to reach out to enough audiences if the price is right,” says Joel Miranda, general manager of advertising sales of the The Malay Mail. “We chose to carry out this campaign on a Monday because we feel that’s when most people are getting back into the groove of a work week,” Miranda says. The campaign will incur additional costs in distribution as it will be deploying promoters to distribute the paper at strategic locations, working with vendor networks to reach more English-speaking markets and using retail chains to push the paper. “By getting the paper into more hands, it’s more effective for our advertisers,” Miranda adds. The campaign will not incur additional printing costs as it will be using its own printing factory. “We want to bring back the glory days of The Malay Mail and to give the younger generation a taste of what news is all about,” Miranda said. 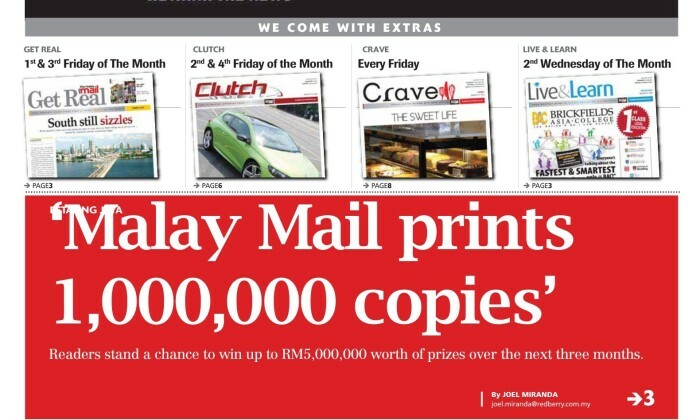 The Malay Mail has commissioned an audit for the day on which the one million copies will be printed and for subsequent publishing days, with a daily print order of 100,000 copies. Malaysians love to do what? It seems Malaysians are more alike than not. GfK’s Roper Report Worldwide has revealed that Malaysians engage most in these top 3 ..
Kyodo Public Relations (Kyodo PR) has partnered with GO Communications, further casting both agencies' nets wider in the Southeast..
LOOK Are you stuck in a bad relationship with your telco? We know break ups can be painful, but can they be for the better? Circles.Life urges you to make that tough call. ..